While the space between floor tiles is usually filled with grout the space around the edge of a floor is usually filled with silicone. 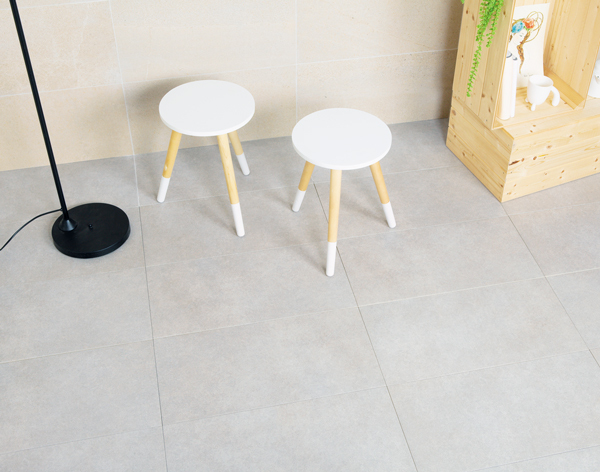 Silicone is quite flexible, which is suitable for the space where the floor joins the walls. This joint will undergo some movement. Silicone will accommodate this movement. Before applying silicone make sure the surface / space is completely dry and clean. Vacuum the area to remove dust. Remove any old silicone with a scraper or knife. If necessary you can dissolve stubborn silicone with acetone. Check for mildew. If necessary, use a disinfectant to remove this. Use masking tape to cover any edges that you want to protect from silicone. Using masking tape will help you achieve a neat, straight edge on the silicone. Use a tube of silicone in a caulking gun to apply the silicone. Cut the tapered nozzle of the silicone tube at a 45 degree angle. You can cut further back if you want a larger bead of silicone from the nozzle, or leave a smaller hole if you want a smaller bead. It depends of the size of the gap you wish to fill. Apply even pressure to the trigger of the caulking gun and steadily fill the gap. Push the bead of silicone ahead of the nozzle. This prevents air bubbles and helps to flatten the surface of the silicone. Seal the entire length of the gap / space in one session. Release the pressure on the caulking gun (turn the handle up or release the catch) and seal the end of the silicone tube. If you have to alter any part of the silicone you just applied, then use a knife dipped in watered down detergent. This will prevent the knife sticking to the silicone. Remove the masking tape before the silicone sets.